Description: The first theater introduced to the Original Little People line was in 1973 with the #997 Play Family Village. The red half of the #997 base contained a theater with seats and a small stage. 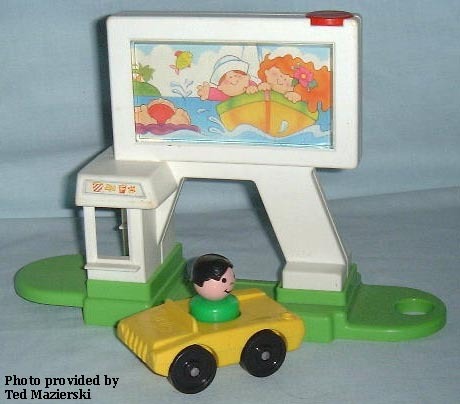 In 1990, the Little People were finally introduced to the big screen with a nice "outdoors" Drive-In Movie Theater. The Drive-In has a pay booth island and a drive-thru ramp beside it. The booth and ramp are under the movie screen. The movie screen turns to show changing picture of a beach/ocean scene. The base that the pay booth and screen are mounted on is an oval-shaped base with a hole on one end and a peg on the underside of the other end. The hole and peg allow the base to connect to the other two "Little People "Village" sets, see #2357 Little People "Village" Assortment. The three bases to interlock together. This set includes the theater screen base, a car, and a figure. These three pieces make this set quite easy to complete compared to most other Little People sets. The only exclusive pieces are the base and the car. B2454 - Drive-In Movie base with a green oval-shaped base that has a hole on one end and a peg on the underside of the other end to attach to either the B2453 or B2455 bases. The base has a white pay booth island with a drive-through ramp beside it, and a white drive-in theater movie screen above them. The movie screen turns via red knob on the top to show changing pictures of cartoon-type beach and ocean scenes. FPT3925 - White top, yellow base 1-seat car with a flat non-ribbed luggage rack behind the seats, a gas hole on the back corner, and the hood is NOT marked. The bottom of the car is marked "©1969-1987 FISHER-PRICE". The car rolls on 4 black wheels with metal axles. The wheels are NOT marked "Fisher-Price Toys". Has a tow hook under the front "grill" area. *See "Variations" below. AWPP - All-plastic Original Little People boy figure with a blue body and black molded plastic hair. *See "Variations" below. FPT665 - Yellow top, white base 1-seat car with a flat non-ribbed luggage rack behind the seats, a gas hole on the back corner, and the hood is NOT marked. The bottom of the car is marked "©1969-1987 FISHER-PRICE". The car rolls on 4 black wheels with metal axles. The wheels are NOT marked "Fisher-Price Toys". Has a tow hook under the front "grill" area. FPT664 - Yellow top, yellow base 1-seat car with a flat non-ribbed luggage rack behind the seats, a gas hole on the back corner, and the hood is NOT marked. The bottom of the car is marked "©1969-1987 FISHER-PRICE". The car rolls on 4 black wheels with metal axles. The wheels are NOT marked "Fisher-Price Toys". Has a tow hook under the front "grill" area. AXPP - This set has also been seen with an African-American blue body boy with black molded plastic hair.